As Filurk, the game's fearless protagonist, you must make your way through countless mind-boggling mazes. In order to succeed, you'll have to bring some color to the lives of all the mysterious inhabitants of the game world (who we for some reason call Wantings). What's that? You want to know more about this masterpiece, you say? Well then, get yourself a cup of hot chocolate, settle down and make yourself as comfortable as humanly possible, as I recount the glorious story that is the making of Filurk. It all started on a rainy day four years ago (maybe, I'm not sure exactly when it was or what the weather was like). The Pitebros were sitting in our friend Kim's apartment, waiting for the next lecture to begin. Kim himself went away on a lecture or something, but we lived like five or six (scandinavian) miles from the university at the time, so we couldn't go home and watch a movie or do anything not boring. Since Kim had GameMaker installed on his computer, and we didn't have anything better to do, we decided to throw together the world's greatest game. Jimmy drew an ugly little gray blob of a character which I immediately fell head over heels in love with, and who we for some reason named Filurk. I'll have to ask Jimmy about this, but the way I remember it, pretty much all of the basic game mechanics were finished by the time the break was over. That being said, the primitive little game we had by then was light years away from our soon-to-be-finished product, but still. 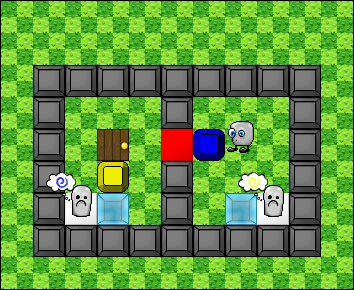 Anyhow, we started learning Java soon after that, so Jimmy decided to make a Java version of the game as well, which turned out even better than the Game Maker one. We also made an online version as part of a course in dynamic web systems (you can download the project report at the bottom of this page). But we figured that since we'd made what was probably the worlds greatest, most genius game ever, it would be a waste not to try making some money off it. Apple's App Store seemed like a good option, so we started learning Objective-C in order to program for iOS. Since Jimmy is a faster learner than I am (than most people, actually), he started working on the iPhone version pretty much immediately, and has done all the programming. As you can see in these pictures, the game has gone through a great deal of visual changes since our extremely simple first version. 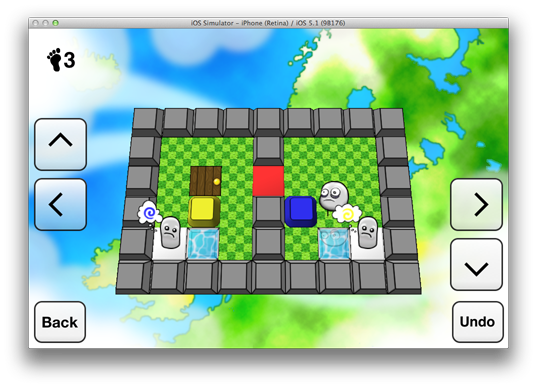 It now sports some nice 3D-graphics, mixed with good-looking two-dimensional sprites and backgrounds. And now, finally, the game is pretty much finished. We'll soon release it on App Store and (most likely) go from penniless, filthy hobos to filthy rich super stars! * Jimmy, Nicklas, maybe some more people too, we haven't done any extensive studies or anything.